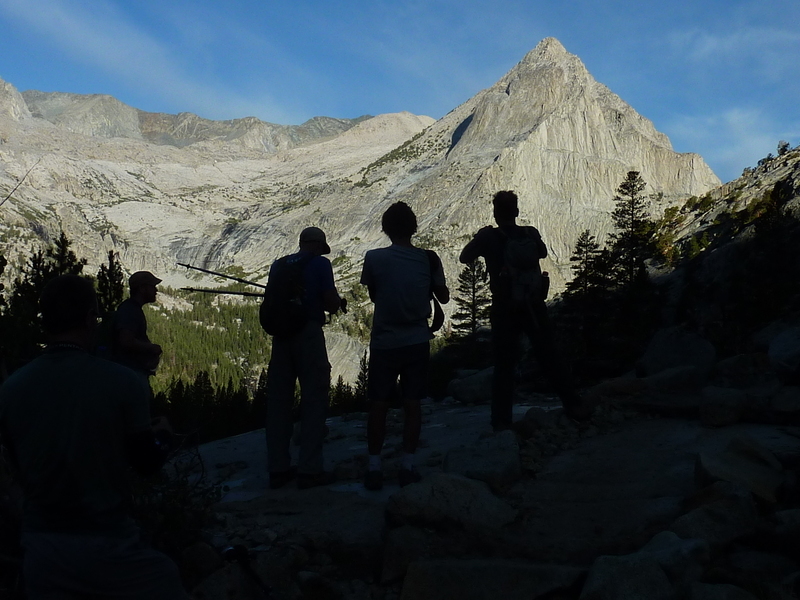 It was terribly dark out when ten of us convened at the Bishop Pass TH at South Lake at 4a. Our goal today, Langille Peak, would be the hardest of this year's Challenge. It is located near the Black Divide, not far from the unnamed 13er we climbed during last year's Challenge - which turned out to be so brutishly hard that I nearly gave up when I reached the base of the peak. That 15hr effort had me reconsider adding the likes of Langille, Rambaud and The Citadel to future Challenges. Langille is arguably the easiest summit in the Black Divide region to reach and by going in over Bishop Pass the cross-country promised to be far less arduous. And so it was with some mix of trepidation and excitement that I was looking forward to today's outing. I had been over Bishop Pass and down to the Middle Fork of the Kings River on four separate occasions, but this would be the first time taking more than a friend or two - this would be a party. The pace leading up to Bishop Pass was not record-breaking, but it was brisk, and I had to stay on my guard to keep up - stop for a potty break or take too long to change out of a layer and you'd find yourself hiking alone for the next hour or more. We reached the pass in under two hours, just as the sun was getting ready to rise. It would be much longer before we saw the sun ourselves as the Palisades would keep us in shade as we descended into LeConte Canyon, the thin high clouds overhead taking on the glow of pink and orange to mark sunrise at 6a. Not far past Bishop Pass we came across Chris and Matt who had started an hour earlier, knowing they would be slower. They were in for a long day. Eric and Jonathan led the charge down through Dusy Basin, turning west as we dropped more than 3,000ft from the pass, eventually taking us lower than our starting elevation at South Lake. Jonathan showed us some key shortcuts in the steepest part of the canyon where long stretches of granite slabs can be used to bypass a number of switchbacks. Across the wide canyon to the west the sun had already illuminated the Black Divide with Langille growing more prominent the lower we dropped towards the Kings River. It was 7:40a by the time we reached the trail junction in LeConte Canyon, our party now reduced to eight (we picked up Chris who kept up with us for the descent, lost a few others). We followed the signs and the short trail to the ranger station along the Kings River nearby. Ranger Dena was sitting on the porch of the newly rebuilt log cabin as we pulled in, not really sure what to make of our small band. She invited us to make use of her outdoor seating arrangement as Jonathan gave her the rundown on what we were up to. This was a swell little find - in my previous trips I had never visited this station, not realizing how close it was to the trail junction. We paused here for 5-10min to have a snack, rehydrate and prepare ourselves for the hardest part ahead. For almost 4hrs we had plied good trail to reach this remote outpost - now it was time for the real fun - steep uphill cross-country for more than 3,000ft, just about the same elevation we had lost coming down from Bishop Pass. I had thought the crossing of the Kings River might be troublesome, but it turned out we didn't even have to get our feet wet as we found a useful logjam just beyond the ranger station. We toiled for the next 40min climbing steep slopes through forest understory to reach the mid-level cirque found 1,000ft above LeConte Canyon on the SE side of Langille. Here a massive cliff headwall is encountered. The right side nearest Langille looks like it might have class 3-4 slabs that could be climbed, but that might get us into trouble. To the left are a few chutes that break the cliff band. A far left one is wide and filled with talus, the easiest choice but possibly the most tedious. Just left of the middle are two narrow breaks that look to be impossible to scramble. Left of these two is another chute, not as narrow but promising, both as a way up and for a bit of fun. And so it proved, a nice class 3 scramble, a good respite from the effort it had taken to reach the cirque. A small trickle of water coming down was of almost no hindrance, late in the season as it was. Above the headwall was a broad expanse of easy terrain, broken granite slabs leading a traverse north to the southwest side of Langille. Here our group of seven (Chris having fallen behind climbing up from the river) broke up into smaller parties as some of us stopped to get water or eat a snack and then use different routes to traverse this slabby section. I chose the lowest route across these slabs as the shortest route but also the more likely to get stopped by the cliffs. For the next hour I found myself alone as I headed for the summit, though if I stopped to listen I might hear voices somewhere in the distance. The climb of the Southwest Slope was class 2 as advertised, but not very exciting - lots of loose talus and boulder fields to scramble up without much solid rock until nearing the summit. I spied Eric ahead, no surprise there, and he was already at the summit some minutes before I arrived shortly before 10a. It would take less than 20min for the rest of our group of seven to reassemble at the top. The views are as fine as one might imagine, a great swath of the Sierra Crest visible to the north and east. Behind us to the west rises the Black Divide, crowned by the summits of Black Giant, McDuffie, and Wheel. Below us to the north and east, stretching to the south is the wide chasm of the Middle Fork of the Kings River, its U-shape formed by a massive glacier that once flowed south down from Muir Pass. On the southern skyline could be seen the jagged pinnacles of Devils Crags. So many mountains and such great relief, from the 14,242-foot summit of North Palisade to the 7,500-foot level of the Kings River as it makes its way south towards Simpson Meadow. Though not an original, the little weathered notebook serving as a register dated to 1976. Earlier entries to 1972 were transcribed in the first few pages. There were a number of recognizable names in more than 30 pages of entries. Smatko had visited in 1974, MacLeod, Lilley and Mantle in 1976. Galen Rowel put up a 5.10 route in 1988, RJ Secor and Reiner Stenzel paid a visit in 2003. I was surprised that the summit sees as many visitors as it does, averaging perhaps one party a year. Our return via the same route was quick, at least initially. Back down atop the headwall we ran into Matt and Ken making their way to the summit still. We chatted with them briefly and gave them the tip about the narrow chute we had used (they would use it on the way down, having taken the uglier chute further to the left). It took only an hour and half to return to the ranger station where we stopped again to share chit-chat and chocolate with Ranger Dena. She was more animated now than we had caught her earlier in the morning and we would have loved to stay and converse into the afternoon - save for that monster climb we still had to do back up and over Bishop Pass. We consumed chocolate and caffeine as a means to steel ourselves for the task ahead. There were just Nick, Jonathan and myself together as we started up for Bishop Pass, Eric somewhere ahead and the rest somewhere behind. Once again we made use of the steep slabs south of the trail to shorten the route some, for which we again thanked Jonathan. We paused at the upper footbridge to retrieve a quart of Gatorade I had stashed in the creek flowing underneath - this was a nice additional boost of cold, liquid sugar to help get me up and over the pass. It was a beautiful afternoon with a mix of thin clouds and blue sky, with the giant peaks surrounding Dusy Basin catching our attention as we passed through this high alpine zone. Two hours and twenty minutes from the ranger station we finally hauled our now tired bodies over the pass. All downhill from here. Chris was not too far behind us when we reached the cirque SE of Langille, watching us go up the narrow chute and following after. Matt reached the cirque much later than anticipated and was ready to give up and head back. He then spotted Ken who had taken the wide chute to the left (south) to reach above the cliff band. This gave him the impetus to continue, eventually catching up with Ken, the two of them continuing to the summit. They ran across first Eric, then me and the others, and finally Chris as he was just descending from the summit. The sun would set before any of them would return to the TH, taking anywhere from 17-18hrs for the day's effort, but one they were elated to have completed. In all we had 10 reach the summit, a remarkable achievement considering the remoteness and difficulty of this summit. "The right side nearest Langille looks like it might have class 3-4 slabs that could be climbed, but that might get us into trouble." Who are you and what have you done with Bob Burd? The view over to Langille and down LeConte Canyon from Mt. Johnson in late November 1976 still (somewhat) fresh in my memory. A mysterious portal, a forbidden black and white landscape . . .